Liechtenstein is Europe's 4th smallest country on the continent in square meters, making it very easy to drive through and be in either Switzerland or Austria while you are in the area. But, Liechtenstein is a must visit if you are around. Not just for checking off another country of your to do list, also because of the following amazing sights! Let Uncensored Travel take you on a tour through this beautiful place! All I knew Liechtenstein from was the Football caps they played against the Dutch team, with the commentator stating that the locar barber was in the striker position and the local carpenter in the goal. But, it is way more than just a bad national Football team. Liechtenstein is a small paradise, not only by nature but also money wise. The average income is 119,000 CHF (yes, Swiss money). It has been independend since the 18th century, when Karel VI reunited two kingdoms to one: Liechtenstein. The main language is German, but because of the tourists English is widely used as well. Liechtenstein is a Schengen country, so free to visit with an EU passport or visa. The best way to get to Liechtenstein is either by bus or car. It is a great car trip to combine with southern Germany, Switzerland and/or Austria! Be sure that if you drive yourself, you will need at least a vignette for Austria for 10 days (€9,-). Going through towards Switzerland will cost you another CHF 40,-. There are also organized tours or even Flixbus which can take you to the capital of Vaduz. Liechtenstein might be small, but it has enough to offer. Schloss Vaduz is one definit must that is the eyecatcher of the capital of Liechtenstein. The castle is still owned by the royal family, the spot where they also receive their post. Since it is private, unfortunately you are not able to visit the castle from the inside. But, the outside is pretty enough! There is free parking just around the corner, and the castle is surrounded by nature all around. A great walk with a magnificant view on the Castle everywhere you go! The castle can also be seen from the city center standing tall on a hill. The old bridge over the rhine (in German: Alte Rheinbrücke) is also an eyecatcher. This 135 meter long bridge links the municipals of Vaduz and Sevelen. It was completed in 1901 and today it is the only remaining wooden bridge over the Rhein. The bridge is only allowed for bicycles and pedestrians. Be sure to stop by the Castle ruins of Schellenberg which is one hour drive from the capital. The ruins are always open for visitors. There is a small free parking (and free spring water) just in front of the Schellenberg. Here you have to walk 10 minutes to get to the entrance of the former castle. Once you enter you can enjoy the peacefullness of the environment and enjoy the ruins of a once mighty castle. Vaduz is also the home of some beautiful churches. First one is the cathedral st. Florin, also known as the Parish church. The foundations date back to the 14th century. We only got a chance to see it from the outside, but it was already worth the quick stop for a picture. But if you think this church is pretty, wait till you see our favorite which is not listed as a hot spot anywhere online: and I have no idea how this church located in the heart of Vaduz is called. Not Google maps or Google can tell me its name, but the pictures say it all don't they. 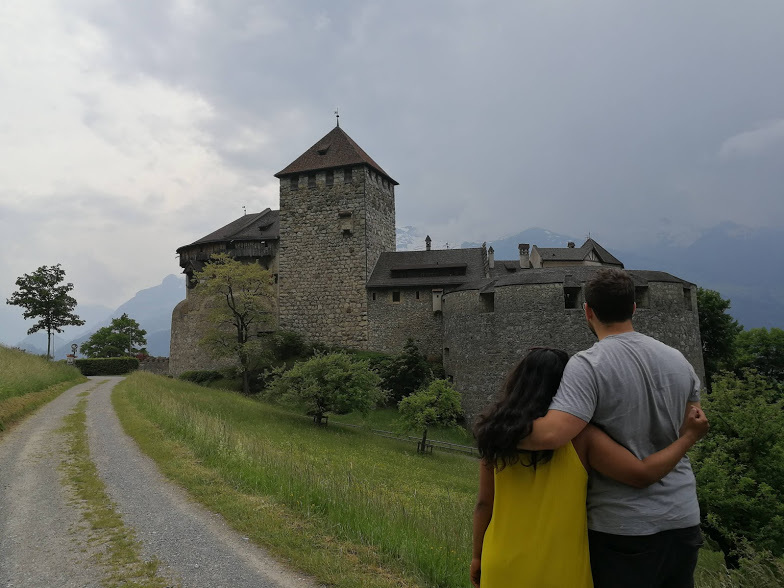 Liechtenstein might be small and we only spend a few hours there (dinner as well, restaurant New Castle is a tip), but we enjoyed the surroundings and nature. It is a great half day trip to combine with either Austria, Germany or Switzerland!